This is a website terms and conditions document. It is suitable for any downloaded product, sold B2B or B2C. Examples are: photo images, instruction manual, house plans, psychometric tests, computer games and a million more. It includes a licence agreement to use long term. It also provides for separate sale of services, for example, a report on a psychometric test, returned to you for that purpose. This document gives you many options, including extensive protection of your website if users are allowed to “inter-act” with it, tough provisions for posting material onto your site, site security and much more. The content of each paragraph is clear, so that you can easily delete a whole paragraph if it does not apply. 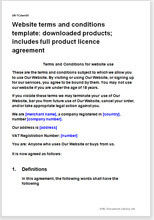 The licence is presented as a separate agreement which the user will accept with the T&C on a single click. We have treated it separately to emphasis to the user the importance of intellectual property and the penalties for failure to comply with the terms you decide to leave in place. This agreement is suitable for software too, but if you have no user interaction on your site, a simpler version is at Software licences, sales and EULAs. If you provide additional material in “hard” form, such as a DVD or book, use TandC licence for download products: supporting material in hard copy; B2B; sub-licence.